I’ve tried a few games now from indie developer Squiddershins, namely Excuse Me!, Cat Poke, and Jables’s Adventure. Much like the developer’s name, these are cute, silly, and not run-of-the-mill experiences, heavy on the pixel art and charm. For instance, in Excuse Me!, you are trying to find the best place to fart, generally away from as many diners as possible, but time is ticking down, so hurry it up. Cat Poke is a slightly more traditional affair, seeing you solve puzzles revolving around making cats happy while stuck inside on a rainy day. Lastly, Jables’s Adventure is a weird platform adventure–the developer’s very own words–starring a young boy named Jables who is told he is a hero by a visiting hat-squid and goes off to do hero-like things, such as beating up lumberjacks. There are more I want to try, but let’s get on with the show, which is Tick Tock Isle. Sure, I will describe Tick Tock Isle as a point-and-click adventure game, but truthfully, there’s no pointing, no clicking. You use the arrow keys on your keyboard to wander around the mansion, talk to people, collect items, and use those collected items on other things and/or people to advance the story. Instead of clicking on hotspots and people, you press the up arrow key whenever Strike is near something interactive, which means there’s no pixel hunting, but rather up arrow hunting. Pressing the Enter key brings up a status screen showing your inventory, a map, and a list of objectives, all three of which are sub-par in actually doing their job. The map is crude, tiny, and hard to follow. The list of objectives are so vague that they might have all just said “Play the game more” five times in a row. Lastly, the inventory…it’s ultimately a collection of the items you’ve found along the way, each with a short description, and they become grayed out after serving their use. To mix up the to-ing and fro-ing action, Strike will occasionally stumble across two kids playing make believe with cardboard swords and castles. See the pic at the top of this blog post for further proof. Anyways, entering their hobbled-together fortress drops you into a platforming mini-game, where, if you make it to the end, you’ll get a specific item that certainly will help you solve a puzzle. These are short, basic platforming sections, where you can also use a sword to swat enemies away, but mostly rely on timing your jumps and avoiding getting hit. They are a quick, enjoyable break from trying to figure out what to do next, but they also feel out of place, like leftovers from a game jam tossed in for good measure. Tick Tock Isle is not a super long game, of which I’m thankful, but I have to imagine that it would have been even shorter if you cut out all the necessary backtracking to the top of the tower to use the time traveling device when you want to move from one year to the other. It’s tedious and confusing until you learn how to speedrun all the doors and staircases, and I wish it could have just been a button press on some handheld device that Strike carried with him always. I also will just come out and say that I didn’t really understand what was happening by the game’s end or its implications or the plot altogether, and there were a couple of tasks in my objectives list that I hadn’t crossed off by the time credits dropped. Oh well. I’m not going back to 2010 or 2009 ever again. I played a little bit of Braid back at the end of August 2011, during the time that Hurricane Irene came swooping on in and knocked out power at Grimmauld Place for a week and then some. Stuck at the in-laws, I only had my Nintendo 3DS and laptop to entertain me videogames-wise–Tara’s dogs and old VHS tapes provided non-gaming fun–and there was only so much of The Sims Social I could take. So I loaded up Steam for like the third or fourth time ever and gave Braid a spin, using just a keyboard to govern Tim and time. It was not easy, but thankfully, the game itself is not punishing, and actually needs you to rewind your mistakes to learn how to progress forward. I got to the end of World 4 before stopping, but let me preface that with the fact that you actually begin Braid on World 2. So, uh, yeah. And for the most part, I just walked from the beginning of the level to the end. Occasionally, I’d tried to get some of those shiny puzzle pieces, but if they proved too complicated, I just moved on. And the game is fine with that. You can literally go from beginning to end on some levels in under a minute. Just keep going right; Mario would be proud. As Jonathan Blow says, it’s “about the journey, not the destination.” Well, my journey was often that of a tourist, going forward and taking in all the gorgeous sights while trying not to disturb history. If I could, I hopped over enemies instead of on them. I do not regret breezing past some puzzles, as they will still be there when Tim decides to return. Some of Braid‘s story elements had already been spoiled for me at that point by the Internet, so that was the least compelling part. The puzzles though, they remained unspoiled…and good for me. They are works of art. Clearly planned and executed in a way that mattered to the game’s mechanics and mood. Even the simplest of them still give off a good feeling aura when completed. Flash-forward to now, 2012, the year of our unmaking, and I’ve been using Steam a lot more thanks to a capable laptop. Y’all remember that I recently bought a second copy of Skyrim, right? Well, I’ve been playing it with my Xbox 360 controller plugged into the USB slot, and it’s been fantastic. I thought to give some other games in my Steam library a chance, too, to see if they were more enjoyable with a controller versus a mouse and keyboard. And they were–Trine and Super Meat Boy. Braid, too. It just felt more natural to jump about and rewind time using a controller. I dunno. PC gamers can hate all they want, but platformers and controllers go hand in hand. Traversed World 5: Travel all the way across World 5. Traversed World 6: Travel all the way across World 6. Solved World 2: Fit together all the World 2 puzzle pieces and align the puzzle in its frame. Okay. Will hop back in soon to hopefully finish Tim’s heroic journey up, though I suspect I’ll need to look up some walkthroughs to get all the puzzle pieces in Worlds 2-6 as many look quite tricky and daunting; however, I’m quite proud of myself for getting them all on my own in World 2, as well as defeating a certain boss using the clone recording mechanic. Guess I retained some skills from playing The Misadventures of P.B. Winterbottom long before Braid. According to the GameStop guy, I was the fourth person to pick up a copy of Radiant Historia yesterday. I should’ve asked him how many fratheads came in for their copy of Bulletstorm, but I forgot. Either way, it’s safe to say that this new RPG from Atlus is either going to sell slow, but steadily or fall victim to being too niche for the industry to pay attention to. I mean, my local GameStop didn’t even have boxes out for it yet under the NEW RELEASES section. Good thing I pre-ordered it. Greg Noe wrote about the game’s first hour, and I’ve played all that and 30 minutes more at this point. Nations are at war, and the world is in clear danger of being turned into a desert. Two time- and space-bending figures, Teo and Lippti, attempt to try again to save it all by putting history’s chances on a soldier named Stocke. Last night, after saving an allied spy, Stocke had to make his first crucial decision, and I’m curious to see how it’ll play out. If it doesn’t go well, that’s okay. The great thing about wielding the White Chronicle is that Stocke has the ability to travel back in time to key events and try things differently. The first sixty minutes of the game, the time that encompasses the Prologue, is very tutorial, which isn’t a horrible thing, but I am eager to get out there on my own and figure stuff out as I go. 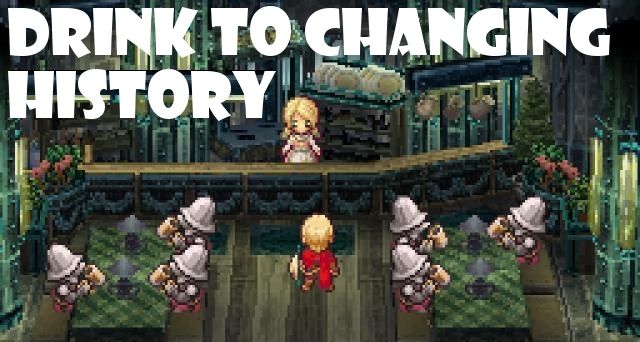 A good portion of Radiant Historia‘s beginning is spent talking and pondering, and thankfully the story and writing is strong. Heck, one of the villians even used the word cacophonous, warming the fire burning deeply in my heart. It is also quite refreshing to see a protagonist that is not silent, that is more like Mass Effect‘s Shepard, that is not a bumbling idiot led by his partymates, but rather a leader, a decision-maker. However, not all is perfect. The sound of Stocke’s footsteps begins to grate, the overuse of cliche JRPG bubble emoticons, and for some reason I find Stocke getting stuck in the strangest of places when running around. Like against NPCs or behind a treasure chest. Something about the collision detection is off. Minor stuff, but irky stuff nonetheless. Still, the story and battle system have their hooks in me already. I want to desperately know what happens when I side with character X over character Y, and even though the game’s opening only had a few fights to it I can clearly see them really becoming headscratchers. These are not fights one can simply auto-battle their way through. Turn order is vital. Planning and precision are also equally important. That’s like the total opposite of Dragon Quest IX (post-game currently) where all I do in that one is run around, spam the attack button, gain experience and coins, and do it all again–all while watching an episode of The Office or something. I think I’m really going to love Radiant Historia. Thanks, Mom.